Hot off the press with this review just in from The Post-It Place. 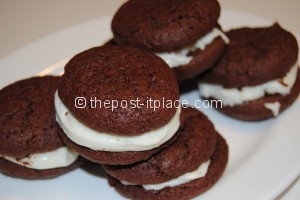 Not only is there a great review of Chupon, but there is a delicious recipe they created using our chocolate Chupon Mocha shavings for Cookies with Marshmallow Icing or Whoopie Cookies! They pictures so good, we have to try the recipe ourselves. They are also running a giveaway, so if you want your chance at snagging some free Chupon, head over to the site and enter! Click here to read the review of Chupon and to see the recipe. Thanks to Jyl of The Post-It Place for reviewing Chupon! Have a recipe you have tried using Chupon? Submit it to us and we will feature it here!